As many as 300 million people around the world need hearing aids. The vast majority of the 7 million people who get them annually are in the U.S. and Europe. One big reason is cost. On average, a set of hearing aids rings up a tab of about $4,000. Most insurance policies don't cover them. A company called is trying to do something about the limited reach of hearing aids by creating a high-quality hearing device that costs less than a tenth the normal price. Stavros Basseas is showing me around his development lab and hearing clinic in a strip mall in suburban Chicago. Basseas began as an electrical engineer in the hearing aid industry, but working with patients directly in this small clinic helped him understand their needs more deeply. "It was not just an engineering project anymore," he says. "It had a human face." Basseas says when people came to him for help he had a chance to talk to them about the effects of hearing loss, especially the social isolation most people experience. But when they put on a new hearing device, Basseas says patients react right away. "Sometimes they cry, because it was like talking to their heart, because they know what is happening," he says. Wayne Jagusch, one of Basseas' patients, knows the feeling. "It's terrible when you're with people and you can't understand what they're saying," he says. "You sit there and smile like an idiot and nod your head, and you don't know whether they're saying something good or bad." Years ago, Basseas fitted Jagusch with top-quality hearing aids that cost thousands of dollars. He brought them in for adjustment on the day I visited. But Basseas also recently gave Jagusch a prototype of the $300 device the company has developed. Jagusch likes it. "This is the best I've had so far, and I've gone through a bunch of different devices," Jagusch says. "I like the adjustability of it." Besides cost, one of the big hurdles to the use of hearing aids is the number of visits required to get the devices adjusted properly. Sound World Solutions addresses that problem by making its device adjustable through a to a smartphone. 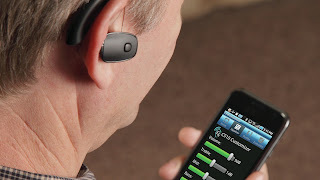 The app first gives the user a hearing test using an earpiece that looks like a small Bluetooth phone receiver. Then the app sets the device to compensate for your hearing loss. A user can also tweak the device manually. "So, I have on my ear the device, the CS10, and we are, at the same time, recording whatever I hear in my ear," he says. "And the device is connected with the smartphone, and I'm going to go through the sequence of customizing the device. If I need a little bit more clarity, I can increase the trebles, and so you can actually hear that the trebles are increased. Or if I like to listen to music and I like a little more bass, then I increase the bass." The device also has presets that can be turned on and off without a smartphone. Frank Lin, a professor of public health and an ear surgeon at Johns Hopkins University in Baltimore, says this kind of device provides a good alternative for the millions of adults in the U.S. who have mild to moderate hearing loss. "You can get it mailed to you, you put it in your ear, you program it yourself with your Android phone, and it's going to be decent," Lin says. "Never as good as the gold standard, of course, but a whole lot better than nothing." Lin's research shows the hearing loss is not just an irritant — it's a serious public health problem. That's because hearing loss increases the likelihood of declining physical, emotional and mental health. "The price point they're talking about is something that makes it a much more affordable [device] — and more importantly, their approach toward it makes it a much more accessible device," Lin says. He's planning to use the Sound World Solutions device in his future research. Lin says another problem with the current market for hearing aids is that the handful of companies that make them have a high-profit, low-volume strategy. That's partly driven by the fact that each company uses its own proprietary technology that costs lots of money to develop. Sound World Solutions has taken another route — it uses mostly inexpensive off-the-shelf Bluetooth technology for its device.